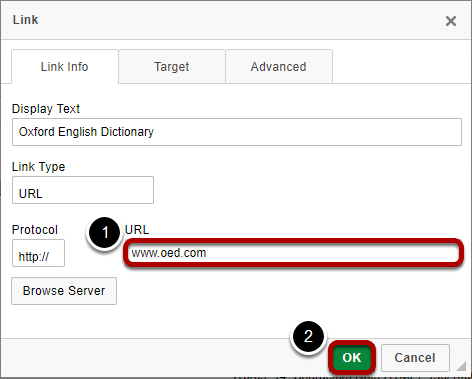 Sakai Community DocumentationSakai 19 User Guide (English) Rich Text EditorHow do I create a link to a web site in a text box? Note: To link to an HTML page you have stored in Resources, see How do I create a link to a Resources item in a text box? In the text box, select the text you would like to serve as a link to a web site. For accessibility, you should use meaningful text to describe your link. Note: If you do not select text, the text of the link will display in full, linked to the site (e.g. http://www.oed.com). The Link window will pop up for you to enter the link (URL). Enter or paste (CTRL-V on PC or COMMAND-V on Mac) the URL for the web page to which you are linking in the box marked URL. Click OK to confirm the addition of the link. The linked text will be underlined. Prev: What are some keyboard shortcuts for the Rich-Text Editor?